"I think this person has a heart of encouragement...This person wanted to encourage me." 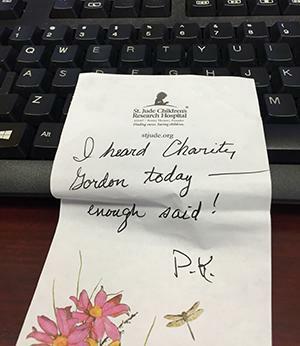 Those were Charity Gordon's comments about a hand written note that included a monetary gift for Imagine No Malaria (INM). The author mailed the message to the Mississippi Conference office that read: "I heard Charity Gordon today, enough said." Gordon is the Mississippi field coordinator for INM, a mission of The United Methodist Church to eradicate malaria in Sub-Saharan Africa. The disease kills a child every two minutes. Chances are this fact alone prompted the donation. "He or she wanted to step into the story and play a role in completing the picture of saving lives by donating," Gordon stated. Since being introduced at the 2016 annual conference session in June, Gordon has made more than a dozen presentations about INM. She is busy informing Mississippi United Methodists on how they can help in the fight. One net can protect an entire family from malaria for about four years for only $10. The Mississippi Conference has set a goal to provide 100,000 nets before the 2017 session. Every local church is urged to be a part of this effort. Gordon said she is eager to meet with congregations. She can be reached at inm@mississippi-umc.org or 662-825-0949. "Anytime I hear about a United Methodist gathering, I want to be there and crash that party to talk about Imagine No Malaria." For more information about Imagine No Malaria, visit http://www.imaginenomalaria.org/.